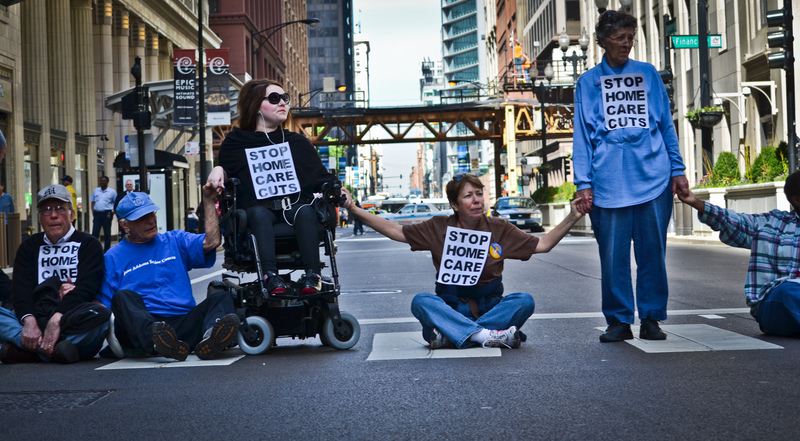 (May 23, 2012, Chicago) — Mike Ervin sat upright in his wheelchair in front of the Chicago Board of Trade. He offered a poetic opening in what would become a day-long series of protests to demand that the Chicago Mercantile Exchange (owned by CME Group) give back its corporate tax breaks on the day of the company’s shareholder meeting. Ervin, and literally thousands of protesters, called on CME to give back its tax breaks in order to stop the state of Illinois from slashing home care programs that help seniors and those with disabilities. Ervin said that CME Group doesn’t need, nor deserve, its estimated $1 billion tax cut over the next 10 years, especially after the corporation earned nearly $2 billion in profits in 2011 alone. (Watch Mike Ervin’s entire speech). 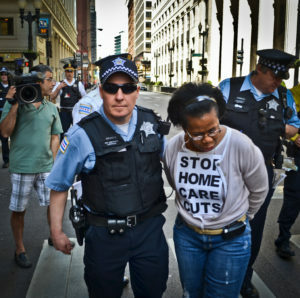 Fifteen protesters were arrested, including three individuals in wheelchairs, when they first blocked the door to the Chicago Board of Trade and then refused to move from Jackson Blvd in downtown Chicago. Home care programs are facing $210 million in state budget cuts that could impact 90,000 citizens. Hours later, a massive rally was held at the Thompson Center, the State of Illinois Building, to fight $85 million in cuts to child care programs that support working parents, especially single moms. Even though CME Group is the most profitable corporation in the state, the cuts could impact 160,000 kids, which advocates pointed to as the very definition of unfairness. The rally to stop child care cuts provided a carnival-like atmosphere for the children and parents to make their voices heard in a playful fashion which included balloons, a tug-of-war against a giant puppet representing a CEO, a game of “duck, duck, taxes,” and a march around the Thompson Center where children blew whistles sounding the alarm to stop the cuts. (May 18, 2012, Springfield, IL) – Illinois took a crucial first step toward preventing a surge in unemployment Friday when legislators passed a supplemental spending bill to plug a $73 million shortage in funding for child care providers around the state. 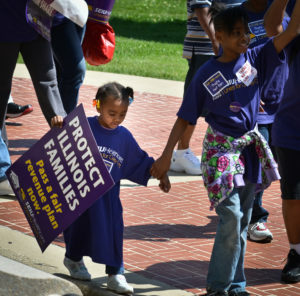 But SEIU Healthcare Illinois and Indiana, which represents over 35,000 home-based child care providers, warned that working parents continue to face threats to their job security unless lawmakers restore $85 million in cuts to child care funding included in Gov. Pat Quinn’s FY 2013 budget. Child care providers and parents called such budget cuts “completely unacceptable” and said that slashing vital assistance would devastate working parents, especially single moms who are trying to go to school and work to support their families. The state’s Child Care Assistance Program (CCAP) supports more than 85,000 working families and 160,000 children. CCAP is intended to promote employment in Illinois by providing working families with resources that they need to hold down a job or finish school. If the state cuts CCAP, it will fuel joblessness among people who are willing and able to work. Providers said that state cutbacks are also incredibly shortsighted. Child care programs help parents work, contribute to the economy, and are key investments in children’s education. These investments save taxpayers money by reducing special education, remediation and juvenile justice costs in the long term. 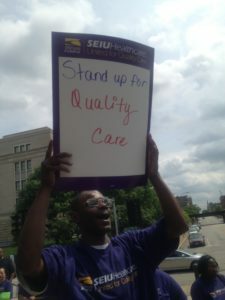 SEIU Healthcare Illinois & Indiana unites more than 91,000 healthcare, home care, nursing home and child care workers across two states in the fight to raise standards across industries, to strengthen the political voice for working families and for access to quality, affordable care for all families. After massive mobilization, emergency funding for child care passes General Assembly! Thanks to thousands of parents, providers and allies storming phone lines, air waves, emails, and the Statehouse, Senate Bill 2450 (formerly known as HB 6164) has passed the General Assembly, guaranteeing funding for child care assistance for the rest of the fiscal year! “Working parents can breathe a sigh of relief that their child care providers won’t immediately shut down, said Annie Yarbary, a home child care provider in Decatur. Providers and parents brought their kids to Springfield to show our lawmakers the faces of those who would be affected by budget cuts. Still, the fight isn’t over. At a lobby day earlier this week, more than 1,200 of us took more than 12,000 postcards from Illinois residents from all walks of life, calling on our legislature to stop devastating cuts to the home care, child care, and community hospitals our communities rely on. Our quick action has averted this immediate crisis, but we’ll have to stay strong to fight off budget cuts as the year goes on. 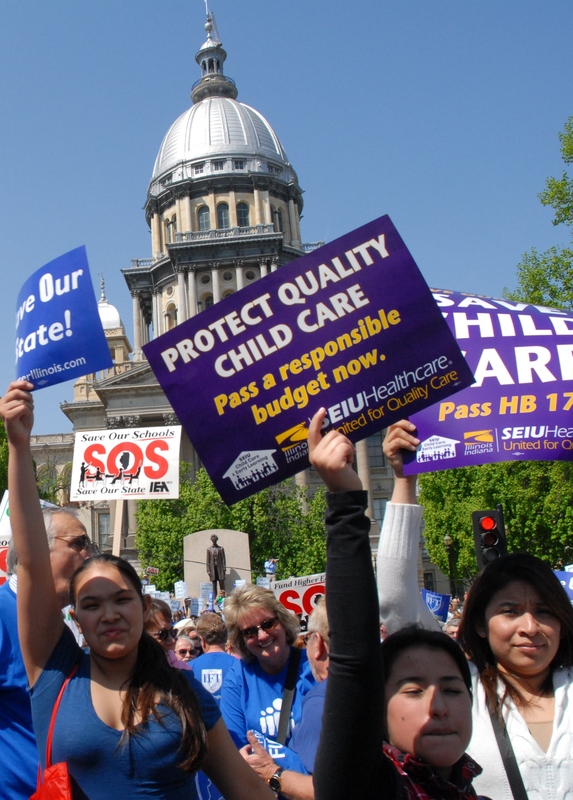 More than 1,200 health care, home care, and child care providers traveled to Springfield on May 15 to speak out against massive budget cuts that threaten Illinois’ working families, seniors, and people with disabilities. 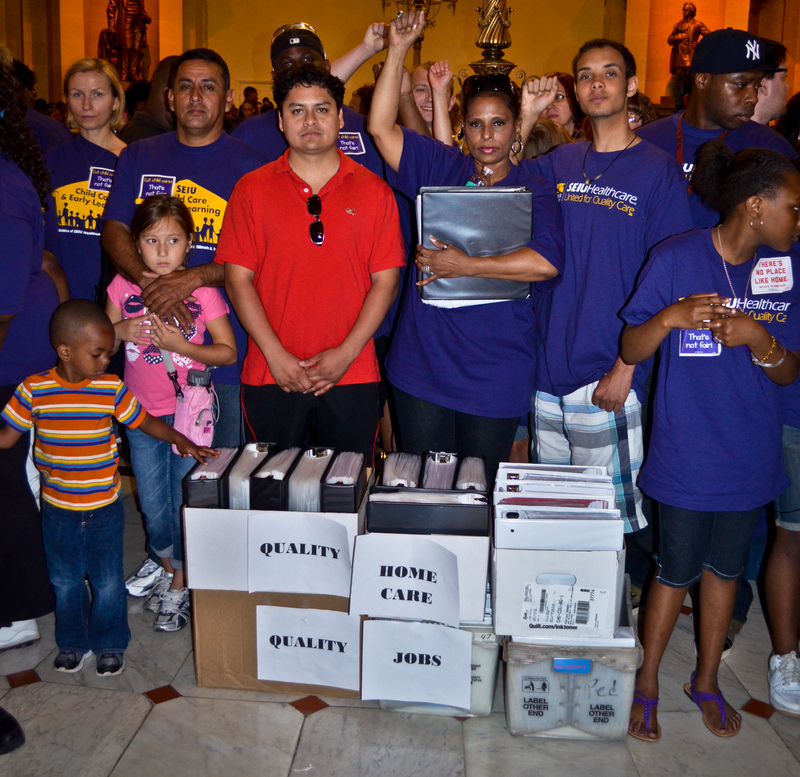 Members delivered more than 12,000 postcards from Illinois residents against these cuts to Governor Pat Quinn’s office. Member leaders called on our legislature to pass a fair tax. “Each and every one of us got on a bus early this morning to come here and make sure our voices are heard. Our presence here today reaffirms our values – doing what’s right for seniors, people with disabilities, kids and working parents, providing quality care for the people of Illinois, and fighting for fairness in our communities,” said child care provider Faith Davis. In recent weeks, child care providers have been fighting an immediate budget shortfall that could leave them without pay till June, threatening to shut down the Illinois child care system that working parents depend on. But proposed cuts to next year’s budget would affect our entire membership, with cuts to home care, Medicare, and Medicaid putting thousands of people who use home care, nursing homes, and community hospitals in danger. 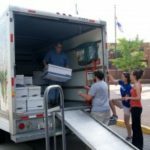 We delivered more than 12,000 postcards to Gov. 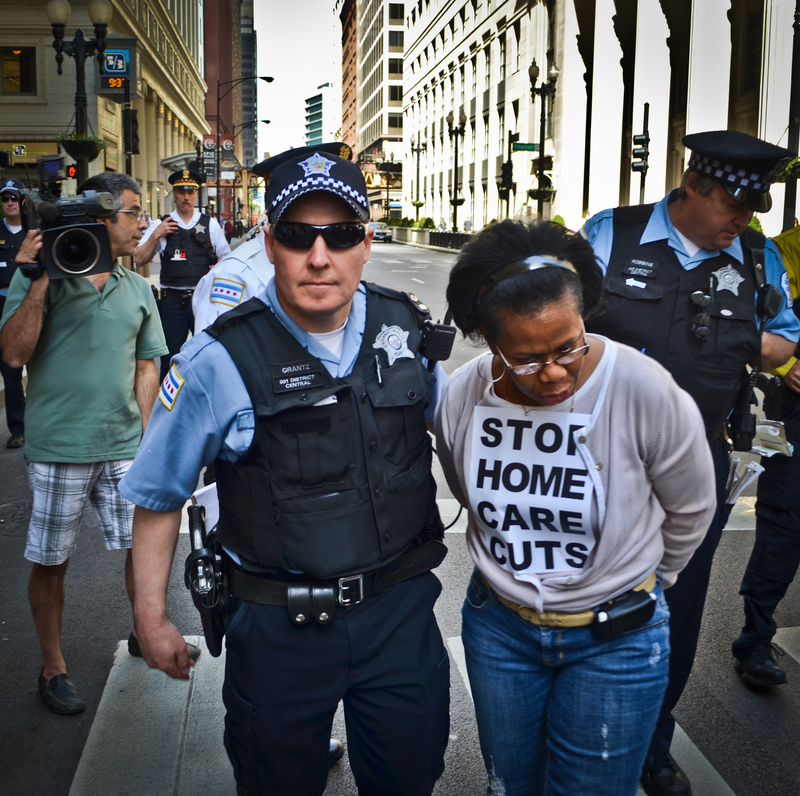 Pat Quinn, from Illinois residents who oppose budget cuts to Medicaid, Medicare, child care, and home care. “I’ve worked at Mt. Sinai for 13 years and have been a patient for 25 years. If these budget cuts go through, it will be drastic for our community. 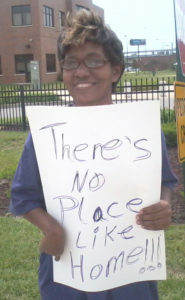 Our state doesn’t have a spending problem, it has a revenue problem,” said Sansaree Brinson, a Chicago hospital worker. Throughout the day, members called on legislators to support a fair tax system in Illinois that puts community resources before tax breaks for rich corporations. Member activists spent this spring fighting to raise the minimum wage to $8.25/hour in Missouri and working to make sure reforms of the predatory payday lender industry are passed. 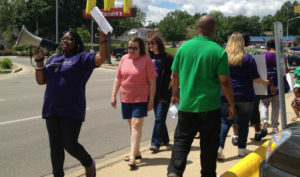 SEIU Healthcare MO and the Missouri Home Care Union members helped collect over 350,000 signatures that were delivered to the Secretary of State on May 6th. Upon certification of these signatures, Missouri voters will be allowed to decide these two critical issues at the ballot box in November. 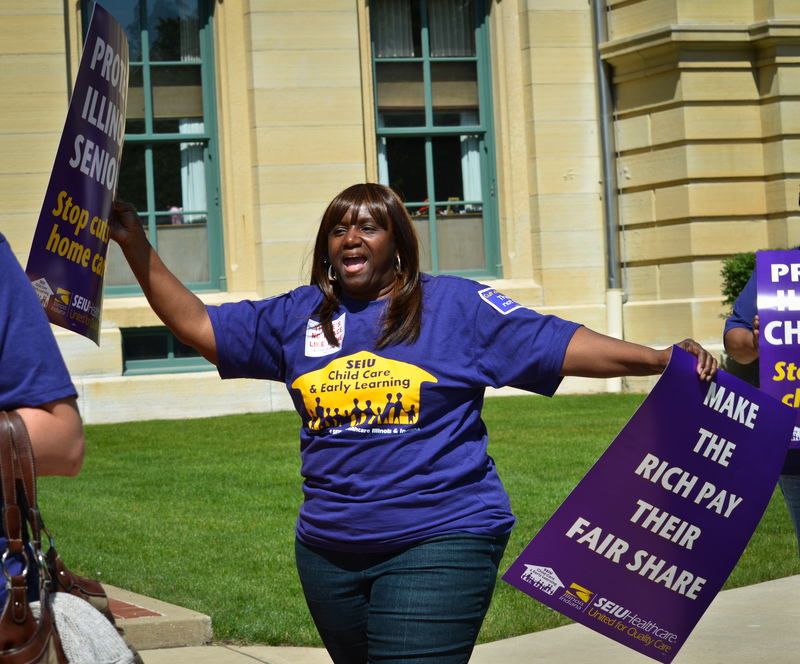 Home care attendant Valerie Gordon spent the last several months tirelessly gathering signatures and has had firsthand experience as a minimum wage worker in Missouri. Below is Valerie’s testimony from the day the signatures were submitted. “I have spent the last several months gathering signatures in support of a raise to our state’s minimum wage – I went to churches, to parades, to my friends, neighbors, and co-workers; everyday Missourians who know firsthand why our state needs a raise. I have been married to these petitions and let’s just say I’m ready for a divorce – it’s time to turn them in so the voters of our state can decide on this issue at the ballot box next November. Right now a minimum wage worker in Missouri earns barely $15,000 a year working full-time and that’s not enough money to live on when the cost of everything else continues to increase. Almost half a million Missouri families would get a raise through this initiative, which would bolster our state’s economy and put working people first. I have been one of Missouri’s minimum wage workers for a long time and I can attest to the struggles that come with increasing cost of living and stagnant wages. In 2003 I made $6.65 an hour and did not get a raise until our federal minimum wage laws increased to $7.25 in 2009. Since then I have only had a thirteen cent increase and I face difficult decisions everyday about which bills to pay. When I get sick I have to decide whether I can spare the $35 to see a doctor at the clinic on top of the cost of gas it would take me to get there. If I’m too sick to go to work and cannot get the care I need, my client suffers and I don’t get paid at all. loved ones. “My home care worker allows me to stay in my community and with my family, where I want to be. Cuts to home care services would not only end the independence I enjoy right now, but would also cut me off from my children because I’d be forced into institutional care. 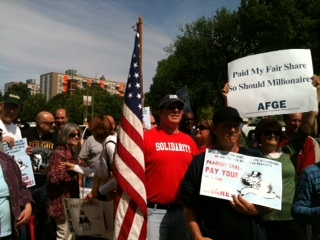 These cuts are wrong for Illinois – the services people like me receive are critical to our lives,” Whitman said. On Tuesday, hundreds of Missouri students, retirees, jobless workers, shareholders, and SEIU HCII members joined a national wave of growing discontent targeting corporate tax-dodging and the devastating impact it has on our communities. In Kansas City, 200 protestors swarmed the Great Plains Energy shareholder meeting demanding that the greedy utility company pay its fair share and stop making kids, seniors, and struggling families suffer through lost revenue and social programs cut to the bone. 35 shareholders attended the meeting and voiced opposition to corporate leaders, before being escorted out. Mic checks, testimonials, and poignant questions from unhappy shareholders were too much for the corporate leaders who like business as usual like CEO Michael Chesser, who raked in $11.9 million during 2008-2010. We’re acting now to fight off devastating cuts to child care in Illinois. Sign up here to join us in Springfield on May 15th, and do your part for kids, working parents, and providers in Illinois. Parents and child care providers across the state hit the ground running after Wednesday’s announcement that a $73 million shortfall in the Illinois budget could leave providers without pay until July– on top of a proposed $85 million cut to the Child Care Assistance Program in FY13– creating a crisis for parents, children and providers. 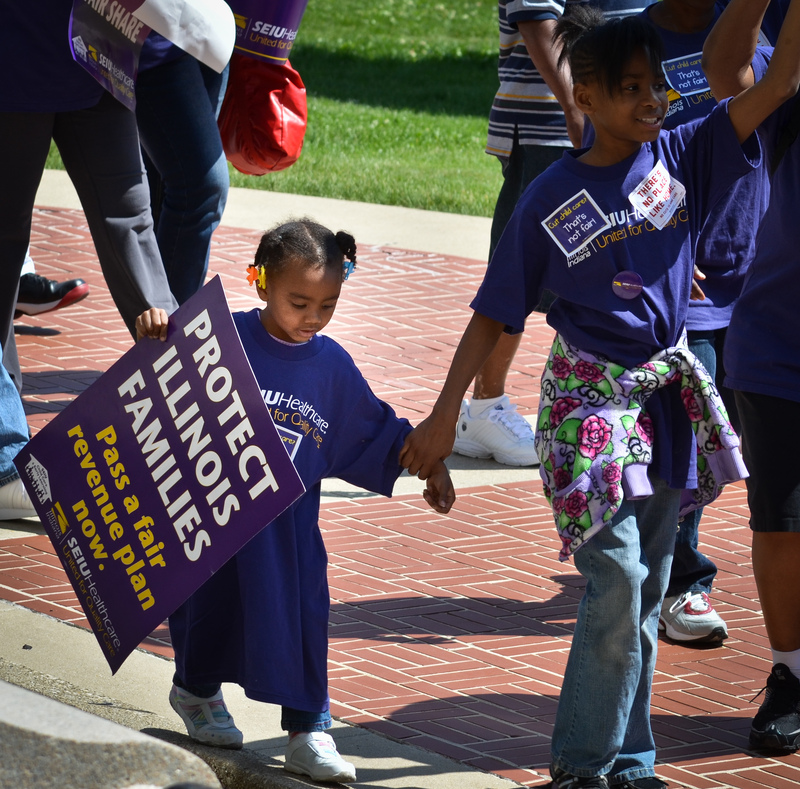 Parents and child care providers are uniting to protect the child care Illinois depends on. “It’s up to us as parents and providers to make sure our lawmakers understand just how devastating this is to all of us,” Vanessa said. Watch Vanessa’s story, which appeared on Fox’s 12 o’ clock news the day after the state announced the shortfall. Several other news outlets around the state have approached providers and parents to learn how Illinois residents will suffer from this budget disaster. Home child care provider Pamela Franks is holding a meeting for parents and providers at her home in Springfield to involve working families in the fight to protect the Child Care Assistance Program. “I’ve been a child care provider for seventeen years, I’m a single mom, and I rely solely on child care payments for my income. Since I got this announcement from the state yesterday, I’m worrying not just about how I’m going to feed my own kids and keep my lights on, but about the five families I care for who are going to suffer because they’ll lose their jobs if I can’t keep going,” Pamela said. “I just started calling and emailing newspapers with my story because we’ve got to make lawmakers see the ripple effect this crisis could have on the state,” Pamela said. More than 35,000 child care providers could be put out of business by this funding shortage, leaving more than 85,000 working parents out of options for childcare when they need to get to work. On May 15, we’re rallying in Springfield to stand up for the thousands of Illinois families who will be devastated by these cuts. Sign up now to join us in Springfield as we fight to stand up for kids, parents, and providers. 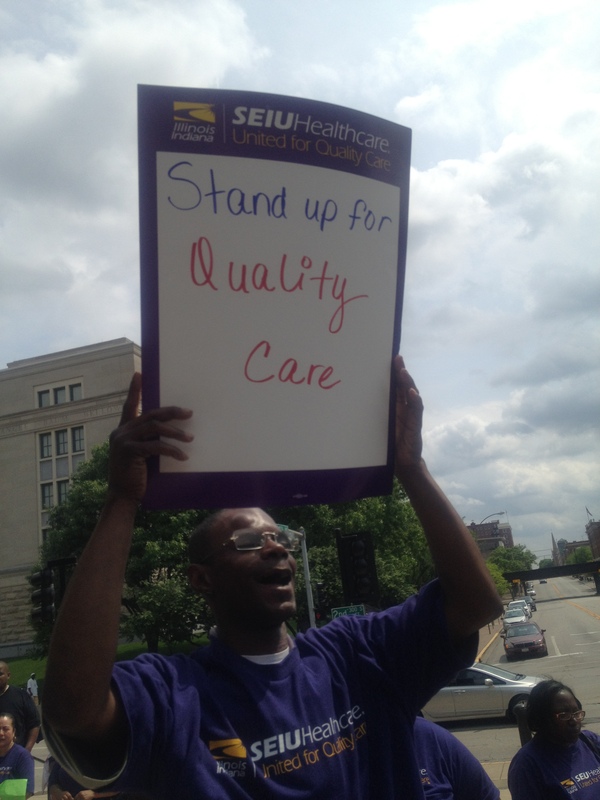 Home care workers and consumers are fighting back proposed cuts to maintain access to quality home care. This week hundreds of home care workers, seniors, and people with disabilities took to the Capitol to fight back proposed cuts to home care funding. Supporters rode buses in from around the state and kicked off the day with a rally outside the statehouse, before heading in to talk with lawmakers face to face about the devastating effects the proposed cuts would have on seniors and people with disabilities who count on home care workers to help them continue living independently at home. Governor Quinn has proposed $150 million in service and eligibility cuts to the Community Care Program that seniors rely on. These cuts would impact up to 8,000 new seniors that will not be able to access the program and would mean fewer hours of care for seniors who are already enrolled. In addition, the Governor’s proposed budget includes huge cuts to the DHS-DRS Home Services Program that provides access to home care services for people with disabilities in Illinois. The proposed $60.5 million in service and eligibility cuts would kick thousands of people with disabilities out of the program, prevent thousands from entering and receiving the services they need, and drastically reduce services for over 14,000 consumers. Click here to check out home care worker Gail Hamilton’s remarks on News Channel 20 in Springfield.